With seemingly unlimited data flowing from countless sources, a growing list of stakeholders and all the variables included in analysis, forecasting for larger organizations can resemble a minefield rather than a gold mine. Producing high-quality statistical forecasts can supply downstream planning processes with high-quality input, but large-scale forecasting must be conducted seamlessly and automatically so it becomes a part of the process rather than a task to be performed. SAS® Forecast Server is designed to automatically deliver high-quality statistical forecasts quickly and efficiently. When forecasting a large amount of time series data, the challenge is to create a robust and flexible setup that accommodates various business inputs as well as the specifics of the time series. 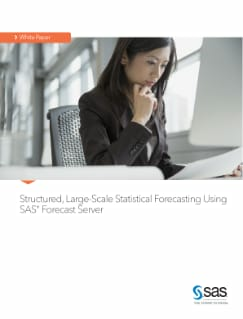 This paper presents a structured approach to statistical forecasting that is both flexible and uses the full power of SAS Forecast Server without compromising user friendliness and manageability. It is intended for non-technical business analysts who want to accommodate complex business forecasting problems, and for more technical users who need input on implementing the SAS Forecast Server.